One of the basic principles of the Indonesian Basic Agrarian Law of 1960 (BAL) is that land has a social function. The BAL has established both a minimum and a maximum limit on landholdings. As of December 1960, under the government regulation in lieu of Law No. 56, the maximum permitted farm size for agricultural activity is 5.0 hectares and minimum 2.0 hectares like in Java. Many questions may be raised about both the feasibility and the purpose of minimum-holdings regulations in Java which is characterised by high rates of landlessness and near-landlessness. 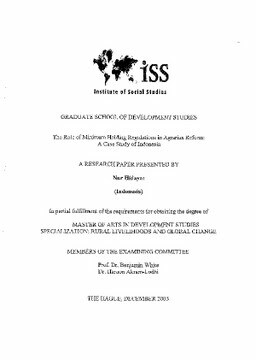 Therefore, this study seeks to : to explore the role of minimum-holdings regulations in theory and practice of agrarian reform through literature study, and analyse through documentary research and interviews, the logic and justification underlying the inclusion of a minimumholdings clause in the drafting and adoption of Indonesia's Basic Agrarian Law in the late 1950s. In addition, to estimate the impact of implementation of the current minimum-holdings regulations on landlessness and land distribution under conditions of high rural population density (using data from the Indonesian Agricultural censuses 1963 - 2003 and taking as a casestudy of the densely-populated island of Java). Finally, to draw insights regarding the relevance and appropriateness of minimum-holding regulations in Indonesia's agrarian law. This study concludes that the instrument to implement land reform program in Indonesia, particularly in Java both under the BAL and the government regulation in lieu of Law No. 56 of 1961 will not work well since it is not based on proper estimation and due to unclear rationale behind it. Attempts to abolish or to compel land ownership of less than two hectares are not feasible. This will also displace millions small farmers and landless peasants in Java. There is a need to amend this policy since it is no longer applicable in practice.